As I mentioned, it was my plan to tell you about my experience at the baths (piscines) in Lourdes, but first I must take a second to lament about this man who won’t stop annoying me on the train. I took my (assigned) seat (I did get a reservation to Paris – not at the exact time that I wanted, but on the next one) and settled in. As we started moving, a man came up and said a bunch of stuff in rapid French and pointed at the seat next to me (by the window). Mind you, this train is EMPTY. There are maybe four people in this whole car of 40 seats. So he sat there for a while, and of course he reeks of alcohol and his pits haven’t seen deodorant in years and tries to talk to me, and I can’t understand it. He sits there for a while, and then after maybe twenty minutes, he makes me get up again and moves across the aisle. Then he comes back. Then he leaves. Then back, then leaves. Now he’s back. If I knew how, I’d ask to see his ticket and send him where he belongs (because somehow I doubt it’s next to me). Anyway, although this is my assigned seat, between the annoying disruption and the stench, I’m moving back a row. If someone shows up at some point, I’ll just move again. 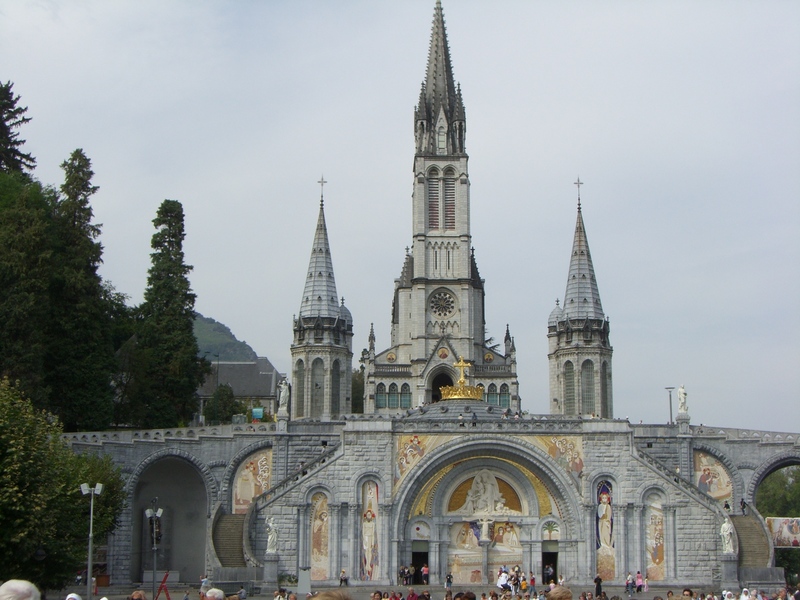 Anyway, about Lourdes: They do the baths twice a day, at 9:30 in the morning and 2:00 in the afternoon. The baths are segregated into men, women, and those that cannot walk for whatever reason. Those individuals, obviously, do not have to wait, which makes sense. I had read to get there about 45 minutes early, but when I walked by at 1:00, the line was already so incredibly long, I decided to get in it. Good thing, because only another 35 or 40 women later, and they locked the gate. At this point you’re either sitting on rows of wooden benches, or sitting on a stone wall just before the covered area with the benches (as I was) in rows of metal gates. It was strangely reminiscent of waiting to get on the Indiana Jones Adventure ride at Disneyland when it first came out (and before they invented that FastPass thing). By my estimate there were 200 of us in line, and there were women who showed up around 1:30 p.m., and were so distressed that the queue was filled for the afternoon, that they started trying to scale the gates! I saw one woman say something angrily to her friends, and then throw her cane over the top with a look on her face like she didn’t care what happened, she was climbing the thing. It was kind of amusing to see that even in a place of devotion and worship, people’s true character still comes through! Meanwhile, at this point the women are led in singing Ave Maria while we wait. Again, it’s a different version of what I normally think of as that song. This was a pretty simple hymn, and there seemed to be no end to the middle verses – like a Catholic ‘Ninety-Nine Bottles of Beer on the Wall’ – and sung by varying volunteers with a microphone. That part was like open mic night or karaoke. Sometimes the versus were sung by groups of women who were clearly part of a tour group, other times by these two women with French Polynesian accents who were rather painfully tone deaf. One I think must have been nervous, because her voice kept cracking the entire time. Lastly, there was a little elderly French nun who had a beautiful voice and she sang for quite a while. Meanwhile, each and every time the women (and maybe the men on the other side of the piscines. I couldn’t hear them, but there weren’t nearly so many as there were females) were called upon to sing the refrain. What’s funny is that there was a man in a suit (a volunteer) conducting us like he was leading a philharmonic orchestra and instructing us to smile. He was also calling out those who weren’t singing or who were making a sour face. It was quite cute – he took his role very seriously, and was tireless in his duties! At that point, you wait. And wait. And wait. And then the baths begin and you slowly shuffle forward, scaling half along bench every four or five minutes. Eventually you are moved inside, and then called into an individual room. In there, they try to determine what language you understand (everyone kept thinking I was German for some reason?). There are about four other women either waiting or just having finished the bath, and a volunteer assigned to each of us. From there, they hold up a blue piece of material – kind of like a top you’d get at the doctor, but without any arm holes – and you are to strip down naked (with your bra in your right hand, an element of the process that really threw me). Then you hold the blue shirt (which is already pretty wet and very cold) around yourself until it’s your turn. When it is, three other women bring you into a room which has a deep white marble bath. They take the blue top away and wrap you in a FREEZING COLD AND WET white sheet. At this point, apparently, you are to say a prayer and cross yourself when you are done. However, a trifecta of events – I had stupidly worn my glasses and they were now back in the other room, so I was a little bit worried I’d slip and crack my head open, the strangeness of having my bra in my hand (was my bra somehow holy or ??? ), and the fact that I was given these instructions in really broken English – made it such that I didn’t really understand that. So we all stood there for a while and they asked, “Fini?” and I realized then what she meant and quickly made the sign of the cross. Someone took my bra from me, and they led me down two steps into the pool. At the end is a statue of Mary to whom I said, “hi”. Then you sit down and the three of them lay you back into the icy water. As they lift you and lead you out, there is a quick prayer uttered to Mary and Saint Bernadette, and they take the sheet off you and two of them put your bra on (at last the whole thing with the bra makes some sense! And I’m glad I didn’t have on a sports bra or a bra that clasped in front or some other complication). You’re led back to the other room – I made an immediate grab for my glasses – and then, and this was very unusual, but sweet, the women dress you. I had worn leggings, so I did that part myself (they were a little tricky to get on, as you’re not toweled off and still a bit wet), but otherwise, they put on all my clothes. I had on a shirt with a lot of little buttons, and a woman very tenderly buttoned them all closed, and then did the same with the buttons of my vest. Then they put on your shoes and give you a hug and send you away. I had read a priests’ recollection that the process is an act of trust and faith like a child. You’re naked and vulnerable and you have to trust other people to lower you into the water and lift you back out. He didn’t mention the dressing part (maybe they don’t do that on the guys’ side? ), but he did think the sheet was a form of penance. I think the sheet is probably to protect some modicum of modesty, and maybe get you a little bit ready for the cold bath. As for me, what I experienced was less like vulnerability and more like being cared for and treasured like a child. It was incredibly sweet and kind of amazing that they do this for hundreds of people each day. Even if the water isn’t miraculous, something about that act of human generosity is. I walked around the grounds a little bit, and realized that I felt dry. I had read that the water dries off miraculously, and although there was still a little wet spot on my leggings, otherwise I did seem to be completely dry. And I have to agree: inane, and excessive, and vibrant, and pious, and ultimately quite touching. I made it. By the skin of my teeth, but I made it. Not to beleaguer the tale, but I waited on the platform for the next train to Narbonne. When it arrived, intense adrenaline kicked in as I tried to find the controller. There was no one who seemed to be an employee, except the driver hanging out of the front of the train. I ran to him and tried to see if he could help me. He didn’t speak a word of English, so I just kept repeating the word ‘controller” until he replied about a ‘chapeau’ (a word I actually understood), so i ran the other way, looking for someone wearing a hat. I ran to the complete other end of the train, but there was no one, and suddenly I heard the creepy warning noise (the French train stations employee this spooky tune before announcements that trains are arriving or departing), and – knowing the train would pull away within seconds – I jumped on anyway. I figured at this point, I’d pay the fine for not having a reservation if it came down to it. I wandered through the cars and eventually found a woman with an SNCF pin on. She, too, didn’t speak English, so I just thrust my Eurail pass at her and tried to communicate that I couldn’t make a seat reservation. 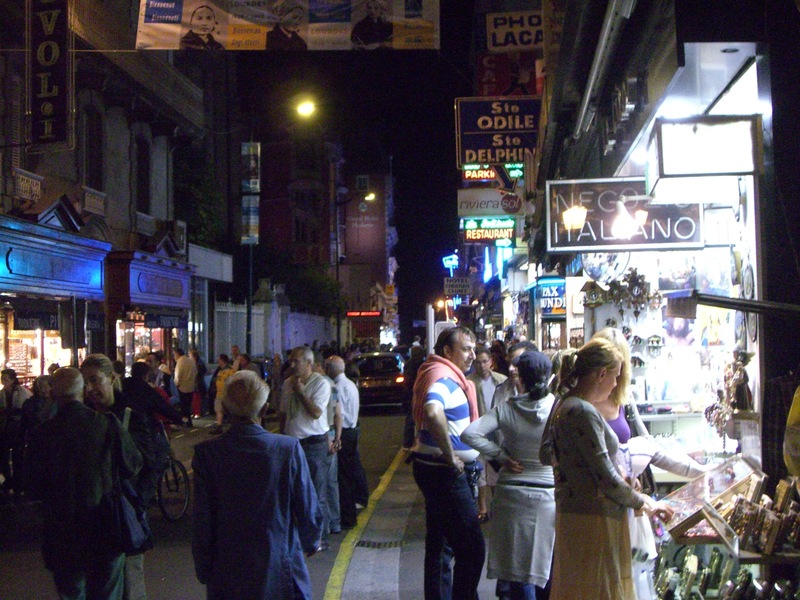 She seemed relatively non-plussed, pulled out a hand held device of some kind, told me ten euro, and printed a receipt. I don’t know if that was a fine or the cost of a reservation, but either way, it got me to Narbonne. 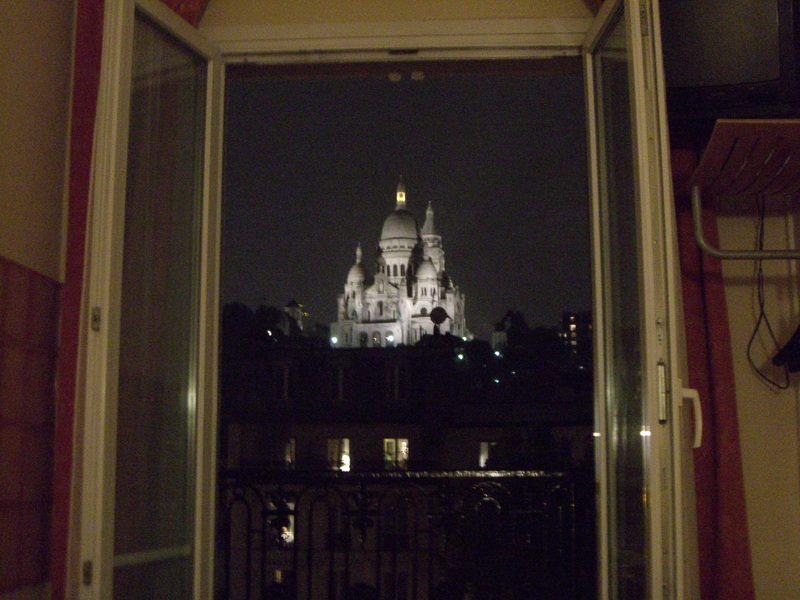 From there, it now being fairly late at night (20:30), I got on the nearly empty train to Bayonne (which stops in Lourdes) and to the hotel as they were locking the doors. 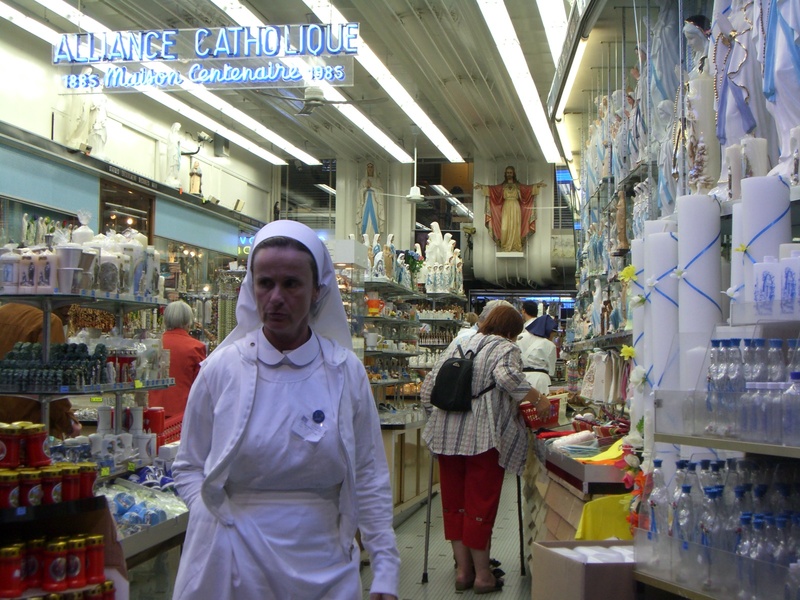 So now that I’m here, let me tell you that Lourdes is a fascinating mix of contrasts. In many ways, it’s a complete and total commercialization of faith. Amid neon the likes of Vegas, you can buy statues of the Virgin Mary in every fathomable shape, size, and race. At the same time, there are at least fifty different styles of container for your Lourdes water (I went with a rinsed out Coke bottle) from tiny glass vials to three-gallon jugs. I’m guessing the people who buy the jugs drove here. Anyway, it’s like Catholic Disney World with all the glitz and flash and retail. But at the same time, once you enter the actual grounds, it is a relatively solemn experience. There’s an incredible church, strangely reminiscent of Cinderella’s castle, and then the taps for the water (which is potable), the Grotto where Bernadette saw her vision, and the baths. I did do the baths as planned, and I will tell you about that tomorrow on the train to Paris. However, for now, let me jut say that one of the things I found truly amazing was the processional. At 21:00 every night, anywhere from three to six thousand people gather in the square below the church with candles, and from there a slow procession winds through the grounds. The sight of the that many people gathered with candles as far as the eye can see is strangely like a rock concert, although the only singing is that of Ave Maria, sung by the whole crowd. I shot a video of a minute of it, although I don’t know that anything can accurately capture the awe inspiring event that it is. It’s also a nice relief to smell candles burning rather than cigarettes. In America, where smoking is super uncool, I’m really not subjected to it very much. In Europe, it’s everywhere. Everyone smokes, except maybe the occasional toddler – the nuns, the priests, the young, the old, you name it. Like I said, I think this could be why I honestly do look younger (less wrinkled, anyway) than some of the early twenty-somethings I’ve met. Anyway, cigarette smokes gives me a killer headache and pretty much nukes my appetite if I can smell it while I’m eating. So sorry to all of you that have to stand fifteen or twenty or twenty-five feet away from any public building to enjoy your Camels, but one thing I cannot wait for when I get home, is the intolerance of smoking!!!! Otherwise, Lourdes has made me think about my paternal grandmother and her sisters (all deceased) quite a bit. My grandmother, Mary, died on New Year’s Eve 1991, during my first year of college. She was an extremely devout Catholic and very important to me, and I think about her – and occasionally buy and light a candle for her – when I am in the churches of Ireland, Portugal, and Spain. Although born in 1911, my grandmother never flew in a plane. She had stories about sneaking onto the back of the horse-drawn milk truck as a girl in Pennsylvania, and truly seemed to come from another time and place. Meanwhile, I’m going to wrap this up and try to find somewhere to post it before heading to the train station, but I just wanted to add: To all you that have made comments to which I haven’t yet had time to reply, I WILL! I greatly appreciate the feedback (knowing people are out there reading this makes the daily effort to write these and then the even more challenging task of finding a way to post it worthwhile), and it’s simply a matter of having to use computers in fifteen minute junctures and with foreign keyboards that slows me way down. I can usually accomplish very, very little in thirty minutes!!! Anyway, until then, thank you for finding this by accident and enjoying it, and Cheryl, I agree on “I Will Always Love You.” You can’t go wrong with Dolly Parton.